FAKE METAL CODICES WATCH: James McGrath covers most of the news in Fake Codices Take The Lead Around the Blogosphere. I commented earlier on the media's treatment of the fake metal codices story here. Background here and follow the links. UPDATE (10 April): I should have explicitly exempted the Times from the criticism above, as I noted earlier. The Examiner and Christianity Today also ran the story of Thonemann's reply, but I don't think of them as exactly mainstream media. That still leaves a lot of top-level mainstream media who should be running corrections and haven't. UPDATE: The Express runs the story of Peter Thoneman's debuking of the codices. WESTON FIELDS is lecturing on the Dead Sea Scrolls on Monday in Nashville. FAKE METAL CODICES WATCH: Thomas Verenna: The Inscription from Madaba, Lead Codices, and the Mona Lisa of Galilee. A good summary of the latest develoments. This forger was not Professor Moriarty. This forger was a careless bumbler. That makes it all the more galling how readily the media fell for the scam. UPDATE (11 April): The "Hebrew" script may not be from the same inscription; Steve Caruso thinks its an unlikely mixture of different ancient scripts. TOMMY WASSERMAN: Early Manuscript of Hebrews Discovered. Early as in second century, which is early. But Wasserman suggests we remain cautious until the early date is verified with some evidence. Good advice. ADVENTURES IN ASSYRIOLOGY are narrated by a Yale undergraduate. Some related thoughts here. Israel’s smallest religious minority offers Jews a glimpse of what might have been. What would the Jews look like had they not been exiled to the four corners of the earth, had they gone untainted — but also unenriched — by the cultures in which they tarried? Imagine Jews who retained their fierce attachment to the Torah and the faith of their fathers, but without the rabbinic response to displacement. No Talmud, no golden flourishing diasporas in Spain or Germany or America, no great movement out of the ghetto and into the Haskala, none of the upheavals of modernity, no Reform movement, no Holocaust, no Zionism, no state of their own, no Nobel laureates to kvell over, only the steady drip of obscurity, anachronism and numerical decline. What would those Jews be like today? The answer revealed itself to me the other day atop Mount Gerizim overlooking the city of Shechem, otherwise known as Nablus, where the High Priest Aharon Ben-Av Hisda, 83, 132nd holder of the post since Aharon, the brother of Moses, was presiding over the Passover sacrifice. He wore a white beard, a loose green silk robe tied at the waist with a wide cloth, and a blue-striped tallit draped over his head. Rising above the jostling assembly of his entire people, which numbered fewer than 750 souls, he clutched a chest-high wooden staff, worn smooth with age, in his left hand. He stood on a small platform facing priests bedecked in white turbans and elders outfitted in red tarbooshes wrapped with a gold and white sash. As the sun set to unveil a full moon, Hisda’s chants (ancient Hebrew and Aramaic comingling in his throat) crescendoed, and with an ecstatic cry the sacrifice rites commenced. All at once, dozens of white-robed Samaritan men, descendants of the ancient northern Kingdom of Israel, sliced their knives into the throats of the lambs — one per family — which in accordance with biblical instruction had been purchased four days earlier (Exodus 12:3-12:4) and had been coaxed to the sides of a long altar. Hisda’s congregants dipped their fingers into the warm, newly shed blood, dabbed it onto their foreheads and embraced one another with joy. The slaughtered animals were skinned and disemboweled with expert haste, skewered on 10-foot spits and placed in fire-pits gaping in the ground nearby, there to be roasted until the midnight feast commemorating the Exodus from Egypt. The article baffles me in that all the other information I can find indicates that the Samaritan Passover does not take place until 17 April this year. Perhaps the article is an unacknowledged reprint from 2010? (It can't be any earlier than that, because the high priest in question only took up his position last year.) Aside from the time traveling, the article has a capsule summary of Samaritan history from antiquity to the present which looks pretty accurate. UPDATE: Yep, it's a reprint from last year. Akma Adam e-mailed the original link in Tablet Magazine here, dated May 18, 2010. What possessed the Jewish Week to reprint it now? WORKSHOP: The Literary Structures of Ancient Jewish Literature. AHRC Workshop at the University of Manchester 11-12 July 2011. Lecturers, post-docs and research students working on any ancient Jewish text are invited to participate in a workshop at Manchester University from July 11-12, 2011. CONFERENCE: ANCIENT RELIGION — MODERN TECHNOLOGY Workshop Call for Papers February 13-14, 2012 Brown University. Via Steve Caruso on the Hugoye list. KJB@400 WATCH: Portraits of the Past: King James Bible translator Miles Smith. "It is said that Miles Smith was 'covetous of nothing but books.'" I'm pretty sure it says somewhere in the Bible that that's okay. MORE DEBUNKING, from Todd Bolen: The Myth of the Burning Garbage Dump of Gehenna. FAKE METAL CODICES UPDATE: Today has been pretty quiet so far, but I note that ArtDaily.com has been taken in by that ubiquitous AP article. I would have thought that they at least would have sense enough to pick up the telephone and ask a few real scholars if there was anything to the story. But no. UPDATE: The New York Post has been duped too. Also, an image on one of the codices looks very much as though it was copied from a fake ancient coin. As I suggested early on, these are not just forgeries, they are crude forgeries. And then there's this, from Remnant of Giants: Latest Discovery: Lead Codices NOT Forged! Definitive Proof. Amusing. UPDATE: Along the same lines: Do It Yourself: Metal Codex Edition (via James McGrath). UPDATE: Don't think I've linked yet to Michael Heiser's comments at PaleoBabble on the importance of peer-review publication: Lead Codices: It’s Looking Like a Hoax. ANN ARBOR, MI -- (Marketwire) -- 04/06/11 -- NovoDynamics®, Inc., a recognized leader in providing advanced information capture and analysis solutions, today announced that VERUS, the company's advanced global language optical character recognition (OCR) solution, is being utilized by Israel's Bar-Ilan University Responsa Project to expand its library of Judaic studies. Bar-Ilan has assumed a leadership role in bringing Jewish studies into the 21st century. Its Responsa Project is the most comprehensive and easily searchable digital Jewish library in the world with the largest electronic collection of keyed-in and proofread texts of Jewish literature. The texts cover thousands of years of writing, from the Bible and the Talmud to current volumes. There are more than one billion bits of data now available on CD, flash drive and the internet, which is widely available to students, researchers and the public. The Responsa Project began 40 years ago and remains active today as researchers have embarked on a 10-year work plan to add another 40,000 books and 10 million bits of data to the library. Relying heavily on optical character recognition technology (OCR), actual letters of texts will be copied from the page to the computer memory, enabling users easy access to information. NovoDynamic's VERUS OCR for Middle Eastern languages is helping researchers overcome some of the difficulties in recognizing the ancient Hebrew texts that are an integral part of the Responsa Project. I'm going to hazard a conjectural emendation and suggest that we read 10 billion bits instead of 10 million in the third paragraph. Ten million bits would be about 1/6 of one of those old 8-megabyte floppy disks, which is not very impressive for a 10-year project and can't be right. With 40,000 books, 10 billion bits would average out to 31,250 bytes/letters per book, which makes more sense. It's a little embarrassing for NovoDynamics that such an elementary error ended up in their press release. Some background on the Bar-Ilan Responsa Project is here. The earliest known Jewish marriage contract dates to the fifth century BCE, to the Ancient Egyptian area of Elphantine, explains Sharon Liberman Mintz, curator of Jewish Art at the JTS Library, as well as curator of the current Jewish Museum exhibition. Perhaps fittingly, then, the oldest example in the current exhibition also comes from Egypt — from the early 12th century CE. 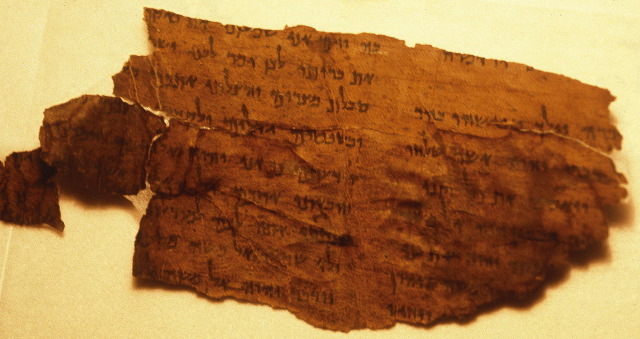 As if to demonstrate continuity amid change, this fragile fragment, which is scripted in ink and gold paint on parchment, with a scattering of simple geometric designs, echoes phrases found some 700 years later in a decidedly more elaborately decorated ketubah on display, this one from 1790 in Yemen. And so sumptuous are some Italian Renaissance designs that the same ketubah would be “re-used” by other couples; they would cut away the text in the center and paste in a new one, leaving those floridly intricate borders intact. Related post from 2004 here. Other past posts that deal with the Elephantine papyri are here, here, here, here, and here. Baruch (Barry) Blumberg (1925-2011) died suddenly on 5 April while participating in a scientific conference at NASA Ames Research Center. Barry was a Nobel Laureate and the developer of a vaccine for Hepatitis B that saved millions of lives. As a founder of the discipline of astrobiology, Director of the NASA Astrobiology Institute, and Trustee of the SETI Institute, Barry has made unique contributions to our science and enriched all of our lives with his wisdom and warm personality. Blumberg has been a staff member at the Fox Chase Cancer Center in Philadelphia since 1964. Concurrently he was Master of Balliol College at Oxford from 1989 to 1994, a rare honor for an American and an experience that he treasured. Barry was a true renaissance man, learned in science, society, and the management of research organizations. His wife Jean is an artist and was always a close companion. In 2005 he became the President of the American Philosophical Society, and he never tired of talking about the contributions this unique organization has made to American learning. He was proud to hold the same position, and occupy the same office, as the Society’s founder, Ben Franklin. In discussing the factors that influenced his life, Barry always gave credit to the mental discipline of the Jewish Talmud, and as often as possible he attended weekly Talmud discussion classes until his death. He believed deeply in the rationality and essential goodness of humans, in spite of some evidence to the contrary. Always an optimist, Barry was confident that eventually logic and rationality will triumph. Other recent blog reactions are also gathered by James McGrath here and here. And Tom Verenna flags some interesting gossip from MEMRI. Unless the media can be interested in the truth, i.e. that the metal plates are forgeries (and efforts are being made to get their attention), this story is running out of steam fast. Are the lead tablets discovered in a Jordanian cave the ancient Christian codices mentioned in the Bible - or the "gibberish-inscriptions" of a modern forger from Amman? One can hardly blame the newspapers: no editor could reasonably be expected to resist the combination of Jesus, the Kabbalah, mysterious death threats and a secret code. But it is a bit depressing that no one thought to consult any one of the dozens of British specialists in the field. As the Jewish Chronicle made clear when it originally reported on the find back in early March, those professional scholars who have had sight of these objects have dismissed them as obvious fakes. There are various reasons why we bother to fund research in the arts and humanities and this episode could have been one of them. This is the first major media outlet that has published the correct story on the codices — five days after Daniel Petersen and I published it on our blogs. Let's hope the rest of the media will want to play catch-up with the Times. "After some discussion, it seems clear that lead pages would have to be made by centrifugal casting, or by a high-impact stamping process, neither of which were available in the pre-modern era. If the codices were made of harder metals, like copper or iron, then the issue becomes even more evident. If you were making a metal book during any era, you would hammer sheet thin enough, and then impress it with a stylus. Lead would be easiest by a long way. Relief decoration would be a technically challenging way to make the books." In the post itself, though, he explicitly refrains from drawing conclusions about the age of the plates. I'M OFF AGAIN, back to Scotland. KLM etc. permitting, I expect to be back in St. Andrews Tuesday evening. Hundreds of linguistic and ideological differences between the commonly accepted Masoretic version of the Pentateuch and the Samaritan text indicate that editing may be one of the world's oldest professions. This tome opens a window through which all readers, not just specialists in the field, can gain an understanding of biblical criticism. It does not require a knowledge of Greek, Aramaic or Latin, languages that are needed to compare the Masoretic text to translated versions. Readers will enjoy the rich intellectual experience that characterizes comparisons of ancient versions of the Bible and will also grasp that such a comparison provides a vital contribution toward understanding the Bible as a human creation. This will also encourage readers to understand the Bible's dialectics of meaning, as a sacred text. As a consequence of its sacrosanct character, endless cultural activity was undertaken to preserve the text and relay it from generation to generation, activity that in turn became a crucial component in the text's fashioning as a sacred work. Some background to the Samaritan Torah Project is here (bottom of the post and follow the relevant links). The UPI can be added to the media hall of shame of those who continue to be duped by the codices after they have been conclusively debunked: Jordan says artifacts stolen, smuggled. Once again, the Examiner is on top of the story, evidently through reading blogs. Justin Fowler: Decoding the Codices, or Much Ado About Nothing. Thomas Verenna has an excellent roundup of the latest on the story, including some new debunking details: New Roundup on Lead Codices and Additional Information (via James McGrath). Note the information on the revised Wikipedia page. Sadly, the media doesn't seem even to be using Wikipedia as a crib on this one. In "Sacred Trash: The Lost and Found World of the Cairo Geniza," Adina Hoffman and Peter Cole recount the discovery of a treasure trove of antique documents from 10 centuries of Jewish life in the storage room of a Cairo synagogue. It feels like washing my hands to post a story about a real "treasure trove of antique documents." UPDATE: Dead link now fixed. Sorry about that. The mainstream press just keeps churning this stuff out, oblivious to the specialist bloggers who have already demonstrated that the inscribed metal plates are forgeries. I can't find anything more from the BBC, which perhaps is to their credit a little. It's possible that they now have a clue and are trying to pretend that the whole thing never happened. But is it too much to hope for coverage of the debunking of the story? As I've said before: when you read or hear, well, anything in the mainstream media, keep in mind that this is their mode of operation. Seize on a sensationalist story (while frequently ignoring interesting stories that are real but not sensationalist); no problem if the story is generated by an obvious crank, as such things frequently are; be too lazy to check out the crank's credentials or too ignorant to read the "energy vibration" warning signs; distort and sensationalize anything said by actual specialists; fail to make a few phone calls to outside specialists for a view; fail even to Google the story to see if any informed bloggers have a view or better information; and instead repeatedly draw on dubious press releases and earlier media stories, often focusing on and playing up the most lurid elements of the earlier coverage. Background here and just keep following those links. UPDATE: Aargh! The AP has been snookered too and the story is now multiplying like maggots on the carcass of the media's credibility. UPDATE: At Rogue Classicism, David Meadows has a careful analysis of the latest from the Daily Mail and the Telegraph: Lead Codices – Once More into the ‘Reach’.